Image Caption: With the unprecedented rise of an extremist anti-immigrant party in the 2018 parliamentary elections, Sweden’s facade of political stability has shattered. While the rest of Europe witnessed a wave of populist and anti-immigrant parties rise to power, Sweden has historically been successful in staving off extremist parties. After the 2018 elections and the rise of the Sweden Democrats, however, Sweden’s Parliament has taken on a new party makeup. In 2018, the Sweden Democrats, a party characterized in Swedish discourse as racist and fascist, won 62 seats — the third largest share — in parliament. Their success coincided with one of the worst electoral outcomes in history for Sweden’s two establishment parties, the center-left Social Democrats and center-right Moderates. Now, the Swedish parliament attempts to reconcile this new political landscape in forming a government. The outsized role of the Sweden Democrats in shaping coalition formation may have profound normative consequences on the future of Swedish politics. Since 2000, Swedish politics have been dominated by a power struggle between its two establishment parties and their coalitions: a left-leaning coalition formed between the Social Democratic and Green parties, and a center-right coalition, the Alliance for Sweden, formed between the Moderate, Christian Democrats, Center, Liberal parties. The Social Democratic party, under the leadership of Stefan Lofven, has led the government since 2014. 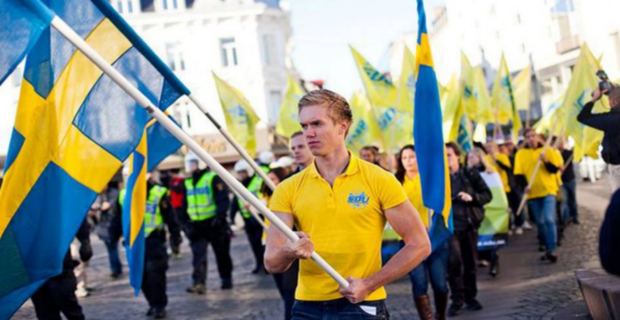 At the periphery of establishment politics, however, the Sweden Democrats began their rise to power by capitalizing on growing anxiety among the Swedish population regarding immigration. Led by Jimmie Åkesson, the Sweden Democrats won their first seats in parliament in 2010, running on a nationalistic, far-right, anti-immigrant platform. They called for a drastic decrease in the number of refugees admitted into Sweden and the creation of a citizenship test among other policy reforms. While the establishment parties focused their campaigns on the reinvigoration of Sweden’s welfare state, the Sweden Democrats established their monopoly on the issue of immigration, effectively painting the establishment as incompetent and out of touch with the electorate. Even in the party’s nascent years, the Sweden Democrats savvily exploited Swedish public opinion to enact their policy preferences. The first signs of the Sweden Democrats’ outsized influence in parliament occurred when the Social Democratic government restricted its liberal immigration policy ahead of elections. On the campaign trail, Åkesson invoked the image of a Sweden descending into violence and factionalism as a result of Sweden’s struggle to integrate the 350,000 immigrants the country has accepted since 2015. Lofven, acquiescing to public dissatisfaction and political pressure, ordered a dramatic decrease in the number of refugees and asylees admitted to Sweden. With the Sweden Democrats commanding a third place finish after the recent elections, the Riksdag begins the uncertain process of government formation. To form a new government, a coalition must receive 175 of 349 votes in parliament. The speaker of parliament tasks party leaders with heading coalition formation discussions. If after four rounds of discussions no viable government is formed, new elections are called. With landmark poor performances from establishment parties in the 2018 elections — the center-left coalition won only 144 seats and the center-right coalition won 143 — government formation will be especially precarious. The Sweden Democrats now play a critical role in government formation, and their votes could decide the makeup of the next government. Already, the Sweden Democrats are upending the historic political hierarchy and alliances in parliament. The first round of coalition formation discussions illustrated the polarizing nature of the anti-immigrant group within the center-right Alliance coalition, led by Moderate Party leader Ulf Kristersson. The Alliance divided regarding their thoughts on allying with the Sweden Democrats. The Moderate and Christian Democratic parties have been ambivalent towards entering into a coalition with the Sweden Democrats; however, the Liberal party refused to enter a coalition with the Sweden Democrats due to its belief that doing so would violate Swedish political norms, while the Center Party stated they would only support a coalition that included all four members of the Alliance. With coalition discussions descending into internal disputes, Ulf Kristersson ultimately failed to form a new government. Now, it is Stefan Lofven’s turn to attempt to reconcile deep divides in parliament to form a government. However, the Sweden Democrats have already maneuvered to undermine Lofven’s bargaining power. Immediately after the elections, PM Lofven lost a vote of no confidence at the hands of the Sweden Democrats, ostensibly punishing the Social Democrats for years of labelling the them as, “a neo-fascist single-issue party,” and ostracizing them from politics. Since a coalition with the Sweden Democrats is off the table, Lofven has attempted to poach the Center and Liberal parties from the Alliance to form a cross-bloc coalition. However, having just lost a vote of no confidence and holding only one more seat in parliament than the Alliance, Lofven has little to offer potential coalition partners. A party that once commanded essentially a single-party rule over Sweden, the Social Democrats, for the first time, enter coalition discussions from a position of weakness. With one week remaining in Lofven’s opportunity to form a government, Swedish politics appears to have reached a critical juncture. As Lofven himself described it, this year’s elections were “about a decent democracy … and not letting the Sweden Democrats, an extremist party, a racist party, get any influence in the government.” If the Sweden Democrats ultimately end up in the governing coalition, it would have a profound normative impact on Swedish politics which has no history of providing legislative voice to extremist parties. Unfortunately, Lofven’s hope that the Sweden Democrats’ will not influence government policy has already been proven wrong. The Sweden Democrats have destabilized the government formation process, fracturing old alliances and power hierarchies. In a policy sense, Sweden’s shift to a more restrictive immigration policy illustrates just the crux of their policy influence thus far.